Oh, that rainbow is great! The corn looks so yummy, too!!! 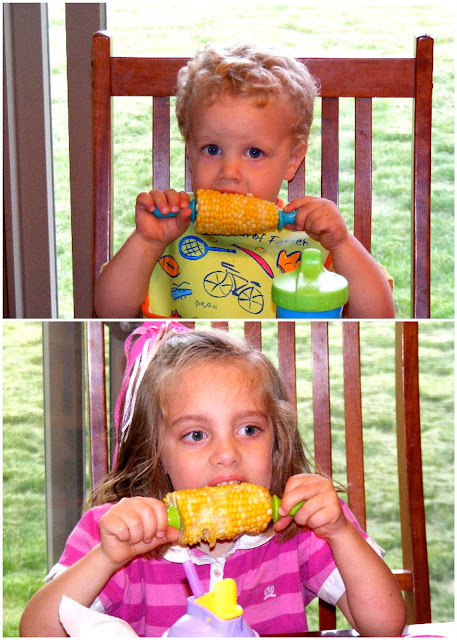 Mmm love that corn! And what a gorgeous rainbow! Sights of Summer indeed. I can't wait until it arrives at my area of the world. Those are adorable! Thanks for sharing.. I bet they are lovin' summertime... winter is fun.. but it got old! I love the rainbow...how great is that! It's been a while since I stopped by. I love the rainbow...beautiful. And the corn looks very yummy. The pictures are super cute and the kids are even cuter.. You are very luck to have them in your life. I'm way behind in my blog reading, but I'm trying to catch up before I get behind again! Looks like the kids are definitely ready for summer and what an awesome picture of the rainbow. Just beautiful!